The Luvabella doll is released in the UK on 1st October 2017. She's likely to be this year's must have Christmas toy and so finding stock might be difficult. We're here to help! Our stock checker will find Luvabella stock automatically. One of our members, Jonny, is keeping a page updated with all the latest Luvabella news. I want the Luvabeau doll, when will I be able to track that release please? Kelsey thanks for replying, hope they release the boy doll in time for Xmas too! Pre-order at Amazon, now. It's just gone live (the blonde girl Luvabella). Please can you add TheToyShop.com to the list of potential retailers for Luvabella. Here's a couple of links to Luvabella Blonde and Luvabella African American. Many thanks. Thanks Johnny sorry for the delay had to add in support for the Entertainer and littlewoods as we haven't used them on the stock checker before. Exciting that you can now pre-order Luvabella from the Entertainer! Your best bet right now for The African American Luvabella Doll is to order one online from The Entertainer, price £99.99. They have a release date for the African American Luvabella Doll of September 26th. The Blonde Luvabella is also available to pre-order from The Entertainer, price £99.99 with an earlier release date of September 9th. Due to the big demand the limit is two dolls per customer. Click on the VIEW NOW links in the Latest Deals stock-checker above to order your Luvabella. Why can I not preorder on the entertainer? Is it because they no longer have stock to pre order? It looks like Smyths and The Entertainer have already sold out of their first allocation of Luvabella stock. No doubt they will get more in due course. No promises OK but YOU might be able to buy a Luvabella Doll from Amazon, click here, by adding a Luvabella Doll directly into your shopping basket. (A nice find this, posted by another Latest Deals member willbeesley1994. Good one Will!). The Amazon link says “This item will be released on September 26, 2017” with a picture of the Blonde Luvabella. Please note that Amazon have not officially listed Luvabella for sale yet, so I’m not certain what version of the Luvabella Doll this is. The blonde one probably? Sorry, but I don't know when Very will open for online pre-orders of Luvabella. I'm watching out for Amazon, ToysRUs and Argos to start too. As to Luvabeau (the boy Luvabella) not seen any sign of him for sale in the UK yet. Yes The Entertainer is for real. It was founded in 1981 and has over 130 UK stores. Unfortunately it's Trust Pilot Score is a (Poor) 3.3 out of 10, so customer service may be an issue on occasion. That said, I don't think Spinmaster (the brand behind Luvabella and Hatchimals) would ship any damaged Luvabella Dolls to The Entertainer or to anybody else - that would be commercial suicide. For comparison Latest Deals has an (Excellent) Trust Pilot score of 9.2, although LD is not a retailer of course, so doesn't have any problems with stock! Out of Stock. Expected in stock: 06 Oct to 13 Oct, and not yet available to pre-order! Please can you add them to the Luvabella Stock Checker. Thanks guys. Here's the links. Are all places getting them on the 1st October or is there different dates? I know this is a UK website but if any of you are living in northern Ireland and are in a position to drive to Dublin www.toys.ie which is Smyth's toys have just gotten a big shipment in of the Luvabella doll. They are priced at €114.99. The more you love Luvabella the more her expression will change - like a real baby! She'll learn as you play with her and, as she develops, will pick up 100+ words (including some phrases). The doll looks to be a step up from the interactivity Hatchimals gave kids everywhere last year. Created by toy company Spinmaster, who claim she's the "most real life baby" ever made. She has real blinking eyes, a mouth that opens to talk and arms that wriggle about. She moves and responds just like a real baby - for example, you can tickle Luvabella's feet and she'll laugh. She really is a realistic baby doll. When you feed Luvabella she'll make munching noises and, once she's learnt the words, she'll tell you what you're eating too. The girl doll is available now with a boy baby doll also due to be released. Luvabella is just like a newborn baby, it's lifelike, you can cuddle it and it's definitely a step up from a barbie. Thankfully thought there are no genuine diapers that need to be changed! 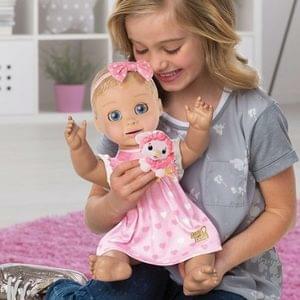 The Luvabella is perfect for a little girl or boy and comes as a white model blonde hair, white doll with brown hair or as an African American doll. We know there have been lots of Christmas crazes and it looks this alive baby doll will be the must have Christmas present and toy of 2017. Hide away the Buzz Lightyears and little pony dolls - get out the prams and strollers ready for Luvabella which is undoubtedly going to be one of the best toys of the year.